What exactly is a business process? According to various definitions a business process is a collection of activities or tasks that produce a specific service or product or a particular goal for a particular customer or customers. Management processes: processes usually that take care governing the corporate and dealing with strategic issues of the organization. Operational processes: the part of processes which constitute the core of business. It usually deals with Purchasing, Sales, Marketing, Product Management, Manufacturing. Supporting processes: this in turn support the core processes to fulfill their aim. It usually consist of processes for Accounting, Recruitment, Call Centers, Technical Support. 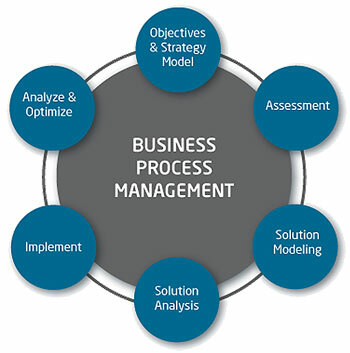 Usually in an organization business process operations vary from the result or outcome of other business processes. And this is called the process chain. The importance of the process chain for the organization is essential since the business processes are designed to be operated by one or more functional units on the organizations. For example if a customer wants to take credit from the bank the first thing he should do is to direct toward the Sales functional unit where they take care for acquisition of new or existing customers. The Sales unit then asks or delivers help to Finance and Accounting unit to calculate the financial condition of their customers and the possibility for him to take credit. After this then the operation is delivered to Product and Manufacturing functional unit to see whether there is a pocket available for the customer. So, from this example we see an interdependence between various functional areas. Can we use Information Technology to automate business processes? Of course, in fact the automation of business processes is so important and crucial that a new definition has been born, that of Digital Firms (an organizational unit which operates most if not all of their business processes through Information Technology). The process operations of some firms even 100% depends upon Information Technology, like for example: Amazon, eBay, Facebook. The point is that most of business processes like: Processing an order, managing the customer information making accounting calculations, registering the products, sale of the products, and Managerial processes like statistics regarding the operation in the firm is done through Computer Systems. 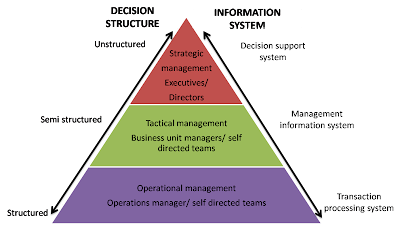 The intersection between Technology, Management and Organization is called Information Systems. From a technology perspective: "An Information System is the interrelated components which takes raw data as input, processes them and outputes valuable informations which can help managers in their decision making." From a business perspective: "An Information System is collection of interrelated value adding activities which helps automates the operations within the organization and in turn helps the managers design better products and make better decisions."